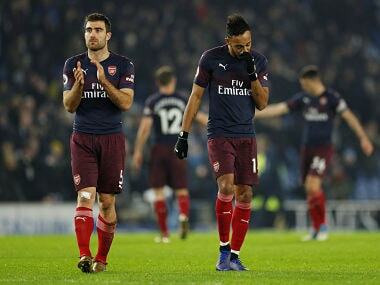 Brighton: Arsenal's top-four bid suffered a setback as Jurgen Locadia's equaliser gave Brighton a 1-1 draw at the Amex Stadium on Wednesday. Unai Emery's side had taken an early lead through Pierre-Emerick Aubameyang's fine first-half strike. But Locadia levelled for Brighton before half-time and the Gunners couldn't find a winner after the interval. Arsenal have won only once in their last four games in all competitions, a frustrating sequence that started when their 22-match unbeaten run ended at Southampton on 16 December. "I'm a little disappointed. I think the first half was key in the match. We started winning and had another two chances, but they equalised," Emery said. "In the second half we couldn't impose our game plan. We didn't make more clear chances to win the match." Emery made a half-time change, bringing on Alex Iwobi for Mesut Ozil, increasing the feeling that the out-of-form German midfielder is on borrowed time at Arsenal, where he is the highest-paid player. 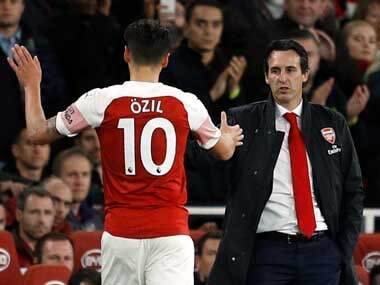 Ozil is reported to have annoyed Emery with his failure to buy into his desire for a high-tempo gameplan and has been left out on several occasions. Defending his latest snub of Ozil, Emery said: "It was tactical. It's the same every match. Sometimes I change it tactically when I need something to change." 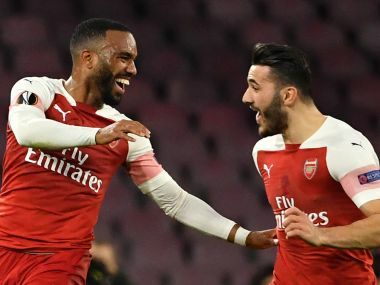 Emery started Aubameyang and Alexandre Lacazette up front and the pair were quickly into the groove. 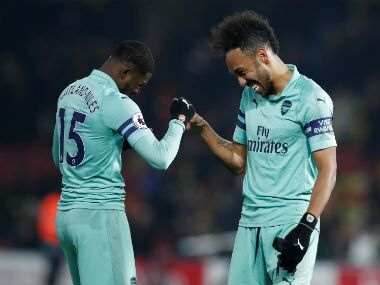 Despite not often starting together as central strikers this term, Aubameyang and Lacazette have established a good understanding and both were denied well by goalkeeper Mat Ryan early on. Even so, it took just seven minutes for the pair to put Arsenal ahead. Lacazette poked through for Aubameyang, who curled a fine effort high into the far corner for his 15th goal of the season. Brighton, beaten in their previous three games, thought they had equalised, only to see Glenn Murray's effort ruled out. Murray bundled his way towards goal and forced the ball, seemingly, over the line. But it was adjudged to have been kicked out of the hands of Arsenal keeper Bernd Leno, who still scrambled back to attempt to claw the ball off the line. Throughout their impressive first season under Emery, Arsenal have remained troubled by the defensive deficiencies that hampered them in the final years of the Arsene Wenger era. Brighton equalised in the 35th minute after a horrible error from Arsenal right-back Stephan Lichtsteiner. The Swiss international attempted to head a long ball back to Leno, but succeeded only in finding Locadia, who took the ball past Leno and tapped into an empty net. Brighton began the second period the stronger, twice coming close to taking the lead. Solly March cut in from the right and his low effort was pushed around the post by Leno. Then March turned provider to tee up Locadia who glanced just wide. Iwobi almost won it late on when he blocked March's clearance and the ball trickled just wide, but Arsenal were force to settle for a point.